If you head to Google.cn, you'll be re-directed to Google.com.hk with a message saying "Welcome to the new home of Google China search." So that's that, I guess. Google is officially no longer censoring search results for China, sending all searchers to its uncensored Chinese-language Hong Kong site instead. Just as Google said it would do after it discovered some pretty serious corporate espionage hackery coming from what turned out to be government-related sources in China, they're pulling out much of its business in the country. Google isn't closing down all of its Chinese offices, keeping some sales and R&D staff on board there, but clearly they'll be making some serious cutbacks to staff. It's a big victory to free speech advocates, who were never happy with Google's decision to self-censor its search results in order to do business in the country. 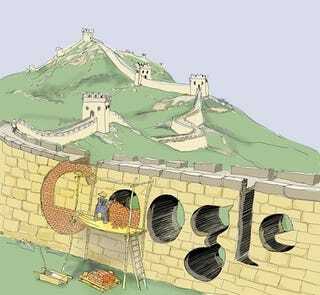 But it's not great news for people inside China, especially scientists, who are used to relying on Google daily.